So here we are, the first time for many months, a new post. 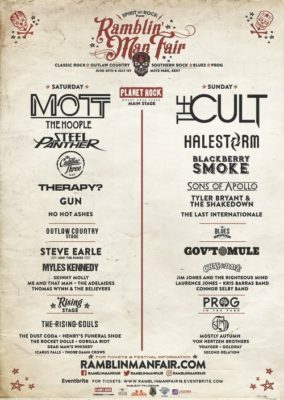 In the middle of the current heat wave we disappeared off to Mote Park in Maidstone for ‘Ramblin Man 2018’, a music festival for proper rockers. It being our first visit, we opted just to go on the Saturday, but next year, we may well do the full two days. I have to say that the music I liked best was nearly all on the Outlaw Country Stage, where the majority of music was Southern Rock oriented, but with country influences as the stage name might suggest. The two best sets were by Skinny Molly – they sent a shiver down my spine when they segued from ‘This is for Y’all’ straight into ‘Free Bird’- and Steve Earle and the Dukes, though I could have done without the bagpipes on the first number. Honourable mentions to Me and That Man and to Myles Kennedy, though a little less backing drone would have been nice on the latter. On the main stage we caught the end of the set by Gun: good and rocky, but not entirely my cup of tea. We paid one visit to the Rising stage, where the new bands play. Henry’s Funeral Shoe (good name) were playing when we got there. One guy with a guitar and a drummer. He clearly knew what he was doing with the guitar, but chose not to play anything listenable and we managed about two minutes of listening to any angry young man being angry at the crowd and taking it out on his instrument. We didn’t go back; I opted for a burger instead. After Steve Earle’s set, there was a half hour wait before the day’s headliners came out on the main stage: Mott the Hoople. As anticipated, they started off with Golden Age of Rock’n’Roll and then played 90 minutes of their classics, finishing off with ‘Saturday Gigs’ as an encore. The band played with an energy that belied their age and kept their collective tongue firmly in their cheek**, for a fun and entertaining set. The only downside was that they didn’t seem quite as tight at times as you would expect from a band of their vintage, where the core of the group has been together for the majority of the past fifty years. Nonetheless, good times and well worth the visit. *Of course, that is quite rude and I would never say such a thing. Probably. **Aerial Bender is quite mad. Dunno wot, but it’s there. Wot wails and creaks and gnaws. It quivers in the shadows. Somefink like a jellied lump. They feeds it wiv a pump. Having been to various galleries and museums and so on over the past few months, I can feel the long-dormant drawing bug stirring in the back of my head. I might even have a go at some comic stylee panels as initially mooted (I guess) some three years back. With the winter slowly drawing to a close and more daylight available, I shall be able to use the conservatory without freezing too much. I hope. Anyway, the position is this: I came up with the basic two or three pages THREE years ago, after discussions with a number of friends, but it all kind of stalled. Since then, my already rusty drawing skills have seized up a little more, but I can work on that to get them back up to some sort of level where a bit of illustration is feasible again. My main problem is that while I can draw figures (when the muscle memory is coaxed), they tend to be stiff and lifeless: I am hopeless at realistic poses unless I copy something. It was always thus, even when I drew copiously and regularly. I sourced some Bandai/SH Figuarts figures on Amazon (I have a wooden mannequin, but that’s not as posable as I’d like), which look to fit the bill. The trouble is, they are horribly expensive, particularly as they are only about 15cm tall. So, despite my overall wariness of all things eBay – at least when things look as though they are likely to be sent from long distance, I went there. I am uncertain that these are actually located in Aberdeen, as the listing suggests. I have a feeling that they are actually deep in some unpronounceable Chinese province. But they are much cheaper than anything listed by Amazon. Cheap enough to convince me to chance my luck. They don’t need to be perfect, but I need something posable and reasonably robust. I don’t care that they have a slightly manga feel to them, I can work around that, but something that doesn’t look wooden and I can use for perspective is essential. It occurred to me the other day, after reading the phrase somewhere (probably the BBC website), that “Smartphone Zombies” would be a great name for a band. Since then, the concept has clearly been bubbling away deep in my subconscious and it popped out again this morning, while I was on my commute in to the office, as a rather more formed idea. Smartphone Zombies would be okay as a band name, but I think, much better for a different type of performance format. Imagine, if you will, two young people – probably blokes – on a small raised platform stage, raised by no more than six inches above the general floor, at once end of the bar in an old East-End pub. They are half sitting on tall bar stools and have a couple of half empty glasses on a table between them. The pair are dressed in trainers, scruffy jeans and hoodies and are obsessively fiddling with their smartphones. They have ear buds in and seem, to all intents and purposes, to be oblivious to their surroundings. Behind them on a low table is a netbook open with the screen facing into the main pub bar. If you can get close enough to read the wallpaper, it reads Smartphone Zombies in a particularly gaudily rendered comic sans font. In the rest of the pub bar, aside from the chatting regulars, middle-aged and older patrons, propping up the bar, or inhabiting the alcoves around the walls, drinking and chatting, there are groups of younger customers in jeans and tee-shirts (and maybe hoodies) sitting huddled around tables clustered near the ‘stage’. Each person is intently staring at and fiddling with a smartphone and each is wearing earphones or ear buds. They are here for, and (possibly) enjoying, the gig. On stage, the Smartphone Zombies are ‘curating’ the music with their smartphones. The music is on the netbook and is being continually sampled, spliced, segued and mixed by the two players wirelessly from their phones. Their audience, meantime, having paired with the netbook over Bluetooth are streaming the music in the order they want it seconds after it has been arranged, assembled and edited by the performers. They are streaming, downloading and forwarding music, feeding back comments and general banter over social media and messaging friends (and each other) without ever ignoring their smartphones. The entire performance is immersive, interactive and almost entirely silent, except for the ‘tish-tish-tish’ emanating tinnily from the headphones. Thank you for peeking with me into the future of live pub entertainment and the first (and only) outing of the “Smartphone Zombies”. Thank you. It being almost exactly a year since we went to see King Crimson play in Hackney, I am pleased to have acquired a copy of the tour box set, the snappily named, “Radical Action To Unseat The Hold Of Monkey Mind” – three CDs and one Blu-Ray of a ‘virtual gig’ from the Japanese leg of the tour. By virtual gig, it seems that it is essentially one performance, but where a particular number was adjudged to have ben performed better another night, they have substituted that instead. I haven’t yet had the opportunity to see for myself, but apparently the use of clever camera set ups among the band do much to hide the trickery. Again, time has not allowed me to do any more with the box set than salivate over it and peruse the booklet, but it looks to be a tour de force. They didn’t perform every track at every gig, but they are all on the CD set. There are some excellent pieces on here and I assume there is a fair amount of improv between times, too. I mean it wouldn’t be a Crimso performance otherwise, right? Some of these pieces haven’t been played by a King Crimson line up in about 40 years (although one or two featured in the gigs played in the mid 2000s by the 21st Century Schizoid Band, of whom every member except Jakko Jakszyk was previously in one incarnation of KC or another, and since then Jakko has joined the latest Crimson line up, anyway!). The CDs are presented as ‘virtual studio albums’ with any discernible audience noise edited off. The technology might be better now, but I think I’m right in saying that Fripp has done this before: clumsily with ‘Earthbound’ back in about 1972 and rather more skilfully with ‘Red’ in 1974 (? ), which for years I didn’t know was essentially recorded live with studio overdubs. I am looking forward to giving this album the time it deserves, which means that it will be at least a week to ten days before I am able sit down and give it a listen. In the meantime I will just have to admire the box artwork. Fripp does need to work on a more snappy titling system, though. I mean “Radical Action To Unseat The Hold Of Monkey Mind” is pretentious guff even by the standards of the mighty King Crimson. Lest this become nothing more than a music blog, I promise to try and vent on something else next time. I avoided talking about Brexit and then kind of avoided blogging at all. Must do better. But now, I must do some work. I’ve just listened to Pink Floyd’s ‘Atom Heart Mother’ on my iPod. It’s the first time I’ve listened to it from start to finish for many years. It is a very interesting experience: I’d forgotten so much of it that it might as well have been the first time I’ve concentrated on it. I’m not really that familiar with Floyd’s output before 1971’s ‘Meddle’ and while it’s years since I listened to that album (I find that I don’t currently own a copy), my memory puts it firmly in their early Prog catalogue, which developed through ‘Dark side of the Moon’ in 1973 through to their final album, ‘The Endless River’ in 2014 (which itself was more of a musical goodbye to the late Rick Wright, than anything truly new). I don’t quite know what to make of ‘Atom’. I guess I’ll take one step further back and listen to ‘Ummagumma’, to try and place it in some kind of musical perspective. I am almost entirely ignorant of any Floyd music prior to that, with the sole exception of the song ‘See Emily Play’ which is interesting (it doesn’t seem to have been on any of the UK albums – certainly not before the 40th anniversary re-releases), but what little I know of the Barratt era leaves me cold. Other bands did psychedelia rather better than the Floyd. ‘Atom Heart Mother’ is late-period psychedia, and to sound suitably pretentious, sounds like music from two years earlier (one of the tracks references 1968) struggling to emerge from its cocoon as early prog. It’s an interesting, but not fully engaging listen. The band have yet to leave dittyville at this point, and the extended use of brass and flutes feels like they took flower power, took it off the hallucinogens and swapped them with steroids. I should do some work! A fortnight or so ago, I went out on the booze with my good friend, Mr Townsend. The pub was packed, but he had discovered that the upstairs sitting room was both unlocked and its small bar staffed. We decided very quickly that paying through the nose for organic bottled cider was infinitely more preferable to traipsing up and down the stairs trying not to spill from pint glasses and hoping that no-one realised that there was additional seating to be had. It worked and we became expensively and extensively blootered over the course of the evening. It was only during the early hours that I realised just how bladdered I’d contrived to get. I woke up sometime around 4am with a thumping headache and a full bladder. I scooted, as one does, to the bathroom and shortly thereafter I was suddenly and remarkably ill. I think my stomach attempted a complete escape – certainly it ejected its coronal layer. I wobbled back to bed and got up again, feeling ghastly, when my alarm went off at seven. It was, as I recall, the work of but a moment to decide that actually, if it’s all the same to anyone else, I was going to go back to bed. Furtle was fully supportive of my ability to barely stand and think, so I emailed the office with the news that I was feeling awful, having consumed something the night before that had disagreed with me. Which was, of course, true: I simply omitted any mention of alcohol; I felt it wise. I then went back to bed and failed to wake up again until gone midday, when I felt better, but not recovered. Of course, taking a Thursday off sick looks suspicious in isolation, so I was forced to keep my head below the parapets on Friday, too. An unexpected 3½ day weekend had something of a transformative affect, I must say, but I should have preferred not to preface it with the worst hangover I’d had for over ten years. Last night we met up again and this time Furtle popped along. We managed to avoid the excessive refreshment of the earlier escapade, but nonetheless managed to get a little frazzled around the edges. We wandered home in due course, getting back to the Gin Palace around midnight. A cup of tea and some toast, then bed. All was well. Except that at 5am I awoke radiating heat like a furnace and with indigestion and a full bladder. There followed a minor, scaled down repeat of the previous escapade and I wobbled back to bed, re set the alarm for 8.30 and crammed in an extra 90 minutes of sleep. I made work, albeit half an hour late, but I’m still not fully recovered. Were it not for the fact that I have the rest of the week off legitimately, I might have sent THE EMAIL. I don’t think cider and I are on quite the chummy terms we once were.